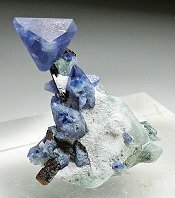 Benitoite Mine - Raw material Minerals from the Benitoite Gem Mine - Trinity Mineral Co.
An update of new specimens just posted from the Benitoite Gem mine. 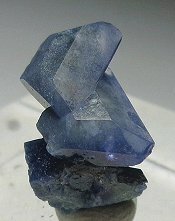 An update of new specimens just cleaned from the Benitoite Gem mine. I just posted images and descriptions of over 40 more specimens from my personal collection. There are over 75 specimens from my collection on line now for you to see. Sorry ! None are for sale. 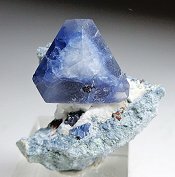 A modest update of new specimens just cleaned from the Benitoite Gem mine. Steve & I just sorted out about 250 more kilos of mine run available now! 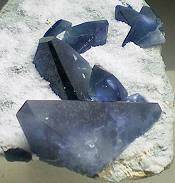 We are offering you the chance to clean your own specimens from the Benitoite Gem mine. This past week Steve Perry and I worked a very large deal with Bryan Lees of Collector's Edge to secure the entire remaining stock of finished, partially finished and all uncleaned material from the Benitoite Gem mine - about 7,000 pounds of material in all !! For the first time I know now exactly how big the "universe" of uncleaned benitoite mine material actually is and what the future supply of material will be and how long it will last. The notion of a finite "universe" of benitoite is a scary thing unless that "universe" is sitting on my property here in Weaverville, California which it is... This first group of new specimens represents much of the inventory of ready to go specimens that were a part of this deal. Steve Perry and I will have an announcement at the end of June to detail some opportunities that this new supply of material will offer you. 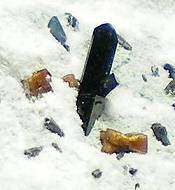 New Minerals from the Benitoite Gem Mine! 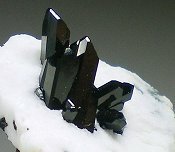 I have cleaned well over 200 new specimens from the Benitoite Gem Mine. Click any of the links above and enjoy the blue scenery! Steve Perry and I have cleaned over 60 new specimens from the Benitoite Gem Mine. Here they are! Click any button to see specimens in that price category. 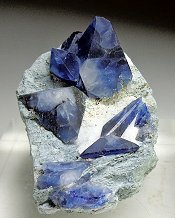 Minerals from the Benitoite Gem Mine! September 30th, 2007 - GOOD NEWS! For a limited time we are resuming the sale of uncleaned mine run material! Collector's Edge - former owner of the Benitoite Mine - had about 2 tons of mine run material left over from the last year's production at the mine. We now know precisely the extent of the known "Benitoite Universe" and it isn't very big at all. Steve Perry and I worked out a deal to obtain this material and are happy to announce the resumption of the mine run sales until the supply is gone. There is possibly going to be one more small pulse of material available after this and that will be it forever. Mine Run sales canceled in January 2008. January 4, 2007 - Dave Schreiner of Coalinga is now making appointments to take people up to the mine for the day. 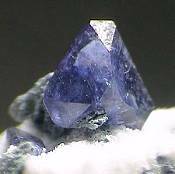 If you want to visit the property and dig for benitoite click here. May 24, 2006 - I recently obtained the domain benitoite.com for this site. I will be using it indefinitely. I am also in the process of starting to clean a large number of new specimens. I expect these to be ready sometime in September prior to the Denver Show. November 15th, 2005 - The mine will be opened for a fee dig operation. At this time the new owner - Dave Schreiner of Coalinga - is trying to figure out how to gain access to the mine using the KCAC paved road. This has not been resolved as of this time. July 20th, 2005 - The mine has been sold to another party. More information will be forthcoming about it soon. July 1st, 2005 - The mine has been rehabilitated and is currently for sale. June 7th, 2005 - It is official - the Benitoite Gem mine is now closed for good. This marks the end of the most important mineral locality in California. I will still be offering specimens for the foreseeable future but the availability of specimens will diminish. May 19th, 2005 - Steve and I have decided to suspend further sales of mine run until further notice. 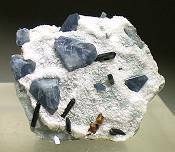 April 6th - I have just returned from the Benitoite Gem Mine and have prepared a report on What is New at the mine...Visit the Mine Run page to see type of material that is now available. June 11th - New specimens from the mine! Specimens in the Cabinet, Miniature and Thumbnail sizes. Also a new quantity of mine run is now available at a reduced cost! Visit the Mine Run page to see type of material that is available - also partially etched specimens are available again on the same page! Lastly, the Testimonial page continues to grow. Where's the story of your new find? April 30th - I have just returned from a trip to secure a large new lot of uncleaned mine run material from the Benitoite Mine - about 4000-4500 pounds worth! Look for new update information around the 20th of May! 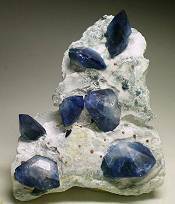 January 14th - New specimens from Bill Forrest - former owner of the Benitoite Gem Mine. Specimens in the Cabinet, Miniature and Thumbnail sizes. 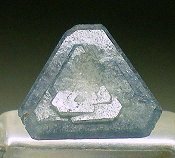 November 10th - My article on Benitoite was updated with lots more information and new pictures. October 12th - Over 40 new specimens were added to the Cabinet, Miniature and Thumbnail size pages. June 16th - A new article on how to clean and prep specimens of mine run. June 3rd - New specimens were added to the Cabinet, Miniature and Thumbnail size pages. May 23rd- News on the 2002 mining season - complete with text, pictures and mpg files! May 15th - Fluorescent specimens added to UVROCKS.COM site. May 4th - Testimonial page on what people are finding in the mine run material they ordered added. April 5th - Raw unprocessed Benitoite Mine mine run material offered.